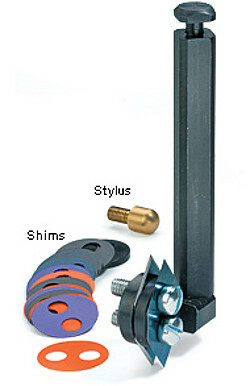 Optional 0.025" and 0.040" groove blades, as well as 10" long steel guide rods, are available separately. All blades are spring steel (hardened to Rc45-50) and double ended; when one edge dulls they can be flipped to expose a second sharp blade. 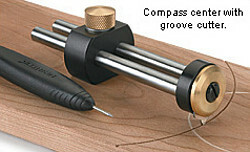 An excellent tool system for layout, cutting and fitting of string inlay. 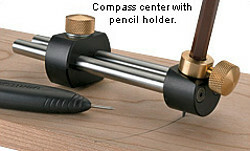 The compass center, used in lieu of the fence, lets the cutter head or pencil holder make circles and arcs with radii from 19 mm (3/4 inch) to 95 mm (3-3/4 inch) (up to 9-3/4 inch with the 10 inch rods). While not strictly required, using a pin awl (available separately) to define the center mark for the compass head makes it easy to position the compass on the workpiece. By replacing the cutter head with the pencil holder, you can draw a design on your work exactly as it will be cut. In addition to providing a line to follow with the cutter, it serves as a dry run to preview how the design will look on your workpiece. 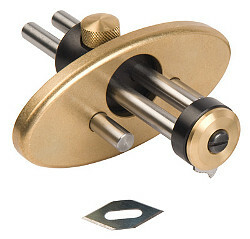 The blades of the inlay groove cutter can be offset up to 235 mm (9-1/4 inch) with these guide rods. Comes with 2 mm Allen key. 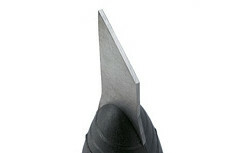 This blade is included in the inlay groove cutter. 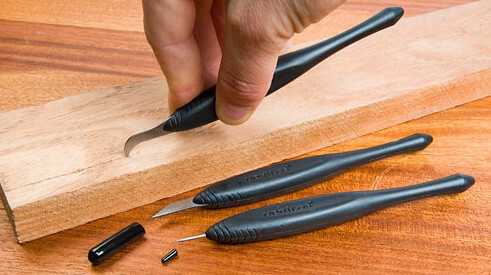 With slender handles for pencil-like control, these tools are useful for freehand inlay work and following templates. 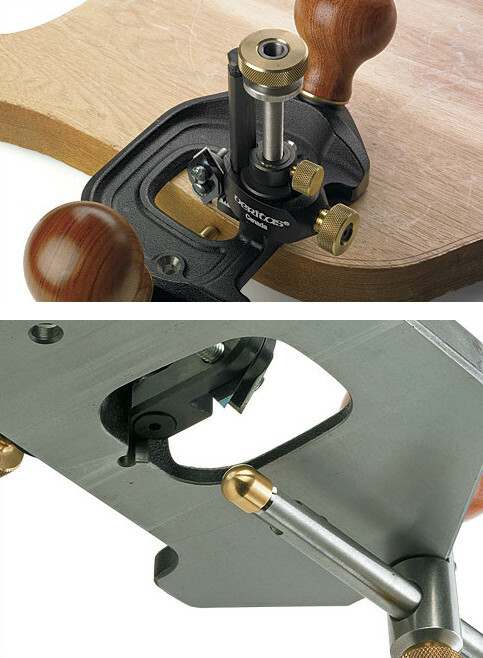 They are also good complements to the Veritas inlay groove and slicing tool since the groove and chisel tools can be used to clean up, deepen or terminate grooves without widening them. 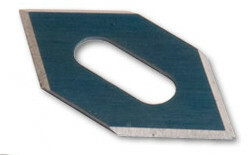 The template groove cutter is available in 0.025 inch, 0.032 inch and 0.040 inch widths and has a V-notched hook blade that scores the edges of grooves for quickly cutting clean channels. The chisel, available in the same widths, has a 30° bevel, and is used for squaring the ends of a groove or for widening a groove section. The awl has a fine tip for marking centers for compass work, and for nudging uncooperative strings into position. The ABS/nylon handles are ribbed for sure grip. All measure about 150 mm (6 inch) long. Blades are made of spring steel hardened to Rc48-51. 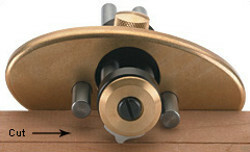 This simple attachment for a Veritas router plane (our item nr. 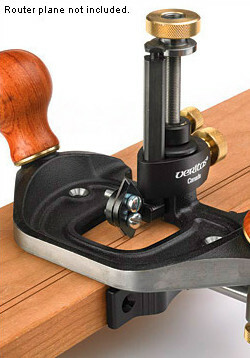 307860) lets you score a shallow groove to accept inlaid purfling, banding or stringing, taking advantage of the plane’s fence and depth-adjustment mechanism to precisely control groove position and depth. An included set of shims and spacers lets you set blade spacing to define groove widths from 1/16 inch to 15/32 inch (1.5 mm to 12 mm). 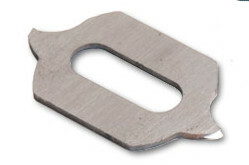 Set includes five each of four sizes of plastic shims (0.002 inch, 0.005 inch, 0.01 inch, 0.02 inch) and one each of 0.04 inch, 0.08 inch and 0.12 inch steel spacers. Replacement blades available (sold individually) on request. The critical dimension for string inlay material is thickness. If too thick it won’t fit into the groove; too thin, and it will leave an unsightly gap. This tool scrapes veneer – or any narrow, thin stock up to 63 mm (2-1/2 inch) wide – to the exact thickness required. The 70 mm (2-3/4 inch) wide blade has two edges ground at 45° so that the blade can be flipped over, reducing the frequency of sharpening sessions. Two brass clamps, tightened with thumbscrews, hold the blade. The skates are 76 mm (3 inch) apart to allow the tool to be skewed to accommodate changing grain direction and prevent chatter marks. Made of aluminum with brass hardware and wood handles, it is 260 x 76 mm (10-1/4 inch x 3 inch) overall. Replacement blade is the same as for the regular Veritas Cabinet Scraper (Nr. 307924).